Creative Virtual, a world leader in customer and employee engagement, knowledge management and self-service solutions, is sponsoring the company’s sixth annual CRMXchange Technology Innovation Showcase webinar titled ‘Humans & AI: The Perfect CX Power Couple’. 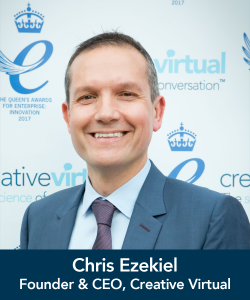 Chris Ezekiel, Founder & CEO, will share a series of live demonstrations during the webcast on Thursday, 6 September 2018 showing how organisations are using the combination of humans and artificial intelligence to deliver a positive customer experience. To register for the ‘Humans & AI: The Perfect CX Power Couple’ webcast, visit the CRMXchange website. A recording of the event will be provided to all registrants. To learn more about bringing together humans and AI to enable anywhere, anytime customer and employee engagement, visit the Creative Virtual website.